In the 2009 World Series of Poker $10,000 buy-in Main Event, 6494 players competed and 648 finished in the money. The so-called November Nine, those players who made the final table and had to endure eight strenuous days of poker, were: Phil Ivey, Jeff Shulman, Eric Buchman, Darvin Moon, Joseph Cada, Kevin Schaffel, James Akenhead, Antoine Saout, and Steven Begleiter. Beating that many players is truly an accomplishment. By the way, the ultimate winner, Joe Cada, earned a whopping $8.5 million, and even ninth place played $1.2 million! I was still in the hunt late on Day Four with about 450 players remaining in the tournament when the following hand came up. With the blinds at $3,000/$6,000 and a $1,000 a man ante, I peered down at pocket aces. An aggressive opponent with almost $1 million in chips opened for $22,000. I was sitting three spots to the left of the button with $135,000 in chips. I had some history with this player, as he beat me out of $200,000 only one round earlier. In that pot, he opened for $18,000 and I min-raised it to $40,000 to go with pocket nines. His A-J prevailed in that hand as the board came a brutal J-J-5-7-3. Now, while assessing the current situation, a few thoughts popped into my head. I could easily make the same min-raise that I made in the previous round. Or, I could just call because my opponent’s raise was so big that I didn’t need to eliminate players behind me. I was also thinking that because I was short-stacked, I needed to gamble by flat-calling with A-A in order to win the most chips possible. Then I cringed as the player behind me in the cutoff called, the player behind him on the button called, and the player in the big blind called! Three out of four possible players behind me called the relatively big raise. I knew that I’d have to fold my pocket aces if certain flops came down. 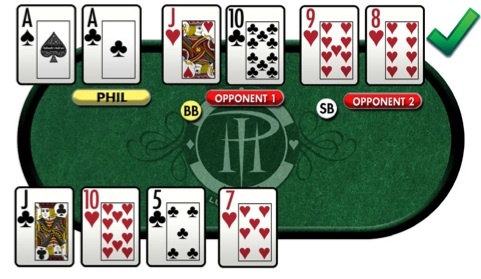 The flop was Jc-10h-5c and the player in the big blind moved all-in for $87,000. When the original raiser folded, I thought I had the best hand so I moved all-in for $113,000. The player behind me folded but the guy on the button muttered, “I know you have three fives and I can’t beat a set.” I assumed from his tone and comments that he had a top two pair. If that were true, I was in trouble. He finally called the $113,000, flipping the J-10 offsuit — by the way, he’d made a horrible pre-flop call. The player in the small blind showed 9h-8h and I indeed was in trouble. Still, I could win with club-club, a five, a running pair, a running K-Q, or an ace. The turn card was a seven, making a straight for the player with 9-8. I could still win the $50,000 side pot if a seven, five, or an ace hit on the river. Nope, I missed and went broke. No doubt I was unlucky to lose this hand but should I have played it differently? A min-raise before the flop would have almost certainly won the hand for me and might have doubled me up. That would have been a logical play as I had min-raised the same player just one round earlier and he beat me for a big pot. Well, I do not regret my smooth call for a second, no matter how many times I run through the scenario through my mind. I do, however, regret that I lost so many chips in the previous round with 9-9. No way I should have min-raised for $40,000 in that spot and then lost $160,000 more! Find my ebooks, tshirts, DVD’s and more right here. Phil Hellmuth wins historic 15th World Championship! 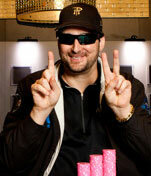 Phil Hellmuth’s “Pokerbrat” – Coming soon to audio book! with the legendary Lee Evans!